Hello friends! I have been working on a new project while I complete my economy blocks. 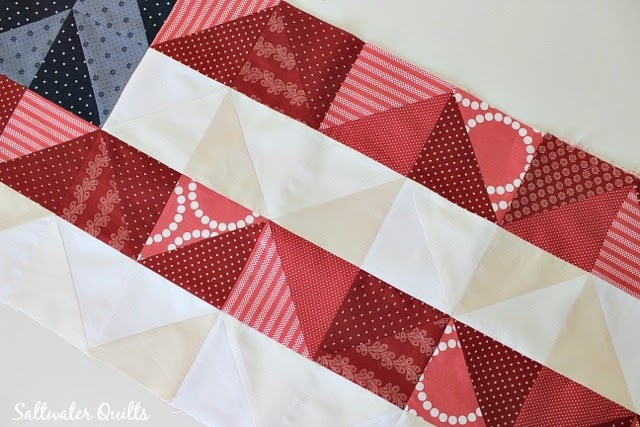 A reversible table runner with one side for Easter and the other for any patriotic holiday. Everything I am sharing with you now, I completed on Friday last week and planned to share it with you earlier. However, I have somehow caught a nasty cold. 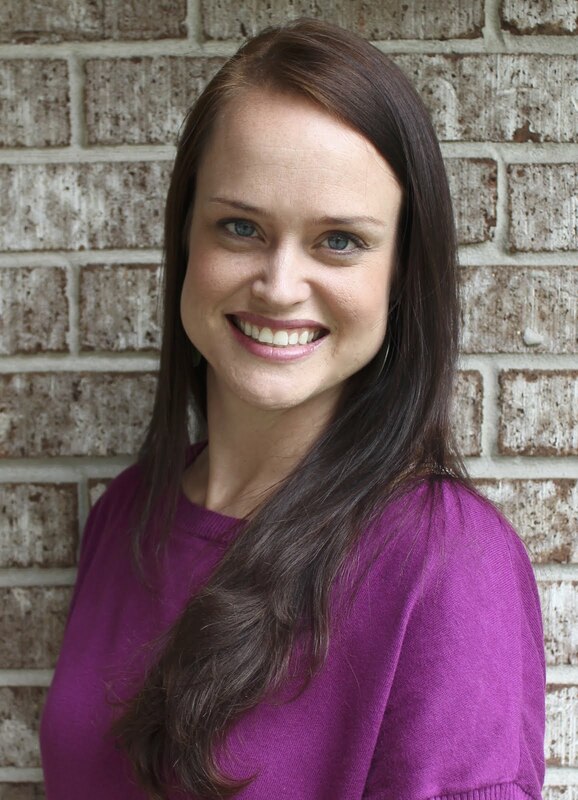 My kiddos and husband have been sick several times throughout the winter season and I guess it finally caught up with me. So there has been no sewing happening around here once I completed both sides of the table runner. I am also waaayyy behind on my house chores which I prefer to spread out over the week, but this time it looks like I am going to have to spend a couple of days to catch up. For now I can share my progress with you. 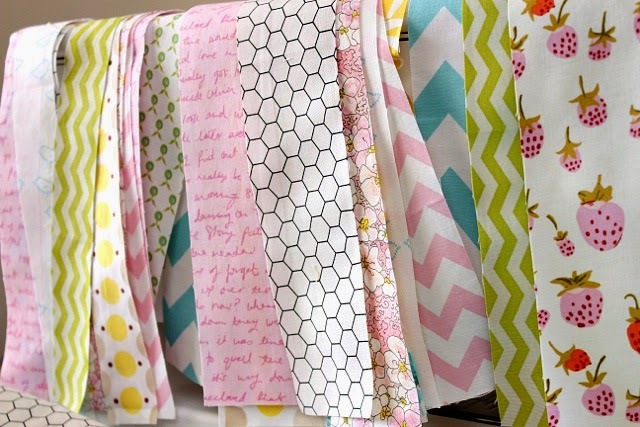 The Easter side consists of fabrics that are good Easter colors. I picked chevrons, several flowers, little birds and chicks, and I love the one towards the center that looks like chicken wire. 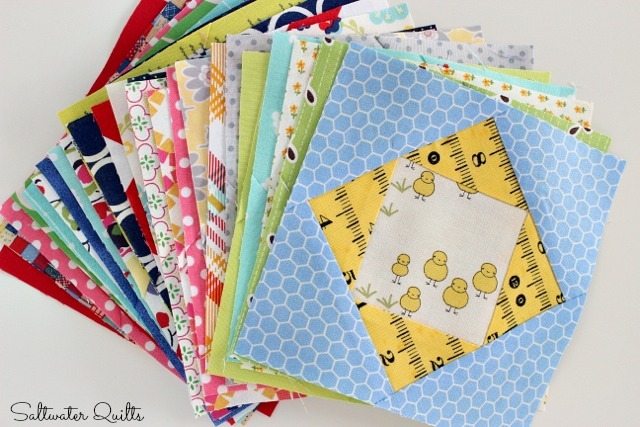 I love the little chicks and the yellow ribbon flower by Denyse Schmidt. The latter is probably my favorite print. I wish she would release a whole collection of ribbon flowers in all different colors. Just like Lizzy House did with her Pearl Bracelets. That would be so wonderful! A girl can dream right? The second side is patriotic and for some reason my reds are looking more coral in these pictures. The deeper reds are almost burgundy. I tried to get the reds to show true, but the pictures did not want to cooperate. I am hoping I will figure it out before I show you the completed table runner. I have made this table runner two other times and this version is a little different. Usually on this side, the pattern creates a chevron print. This time I arranged the colors to make the flag design, but the arrangement of triangles hasn't changed. I hope you have a wonderful week. Hopefully I feel better soon and will have more to share with you in a couple of days. I have been working steadily away on economy blocks. They are simple to put together, but very time consuming. It is a great project to work on slowly throughout the year. 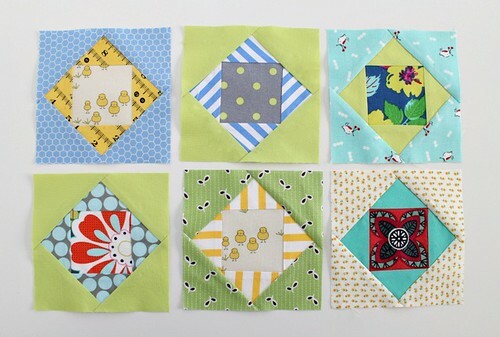 Whenever you are cutting fabric for your latest project, just cut out some squares to set aside for economy blocks. 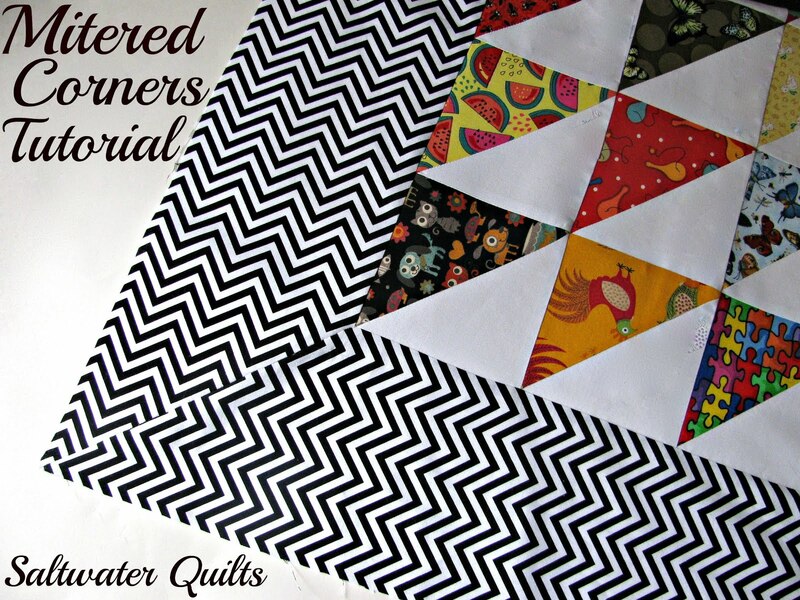 Over a year or two you will have plenty to assemble a quilt top depending on what size you are aiming for. I decided I want to make it all now, which makes for a great deal of fabric play. 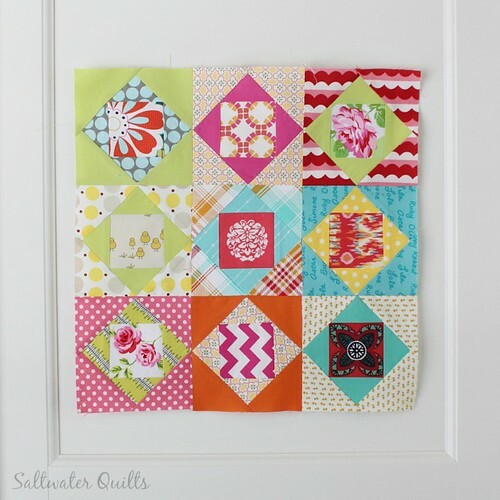 The scrappy look requires pulling many different fabrics, cutting, and organizing pieces for each block. Here are some blocks that I have already assembled. I decided to put them together in squares of 9 blocks. It will be easier to assemble the quilt top this way rather than sew it row by row. 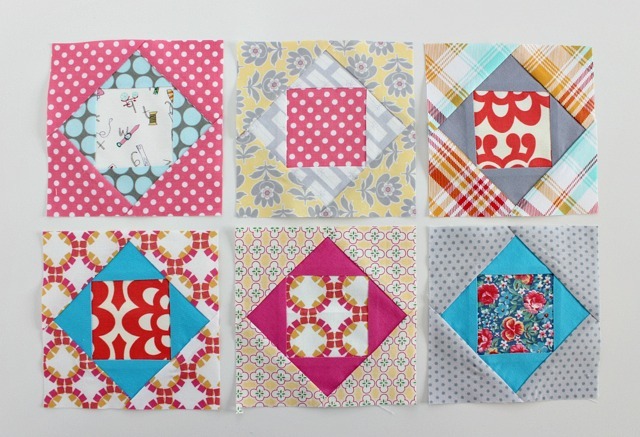 Each economy block is 5" and the tutorial for them is found here on Red Pepper Quilts. I decided to make this quilt a large throw size requiring approximately 200 blocks. These six squares make up 54 of the blocks. I definitely have my work cut out for me. Sometimes I question my judgement in choosing this project and deciding to make it so big. However, I keep on sewing when I think of the final product. 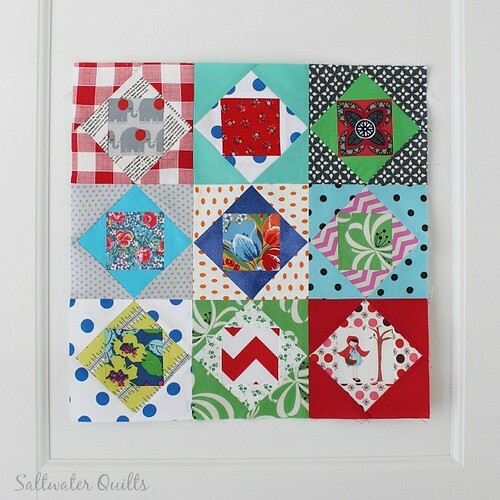 It is going to be such a fun quilt to curl up with and watch TV. My kiddos have already taken a shine to it and I know they will love it when it is all finished. This is a lengthy project, but I really have enjoyed playing with the different fabrics, arranging, and rearranging fabrics that I would not normally put together. It has been a great way for me to step out of my comfort zone and look at colors and fabrics differently. 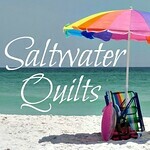 The next time I share this with you I will have a whole quilt top and I can't wait!! 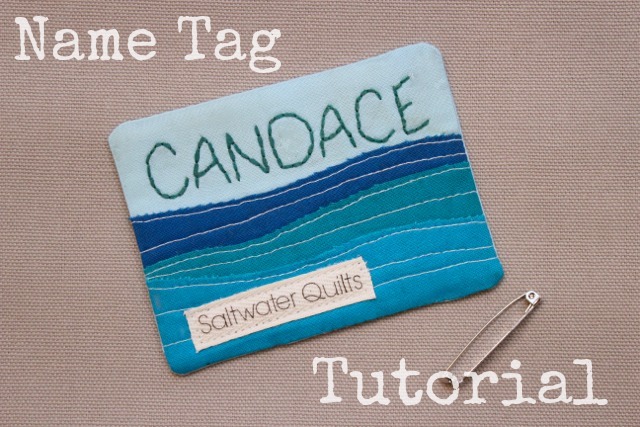 Ever need a name tag... well here is a quick and easy tutorial to make one that represents you and your personality. When it comes to making a name tag there is no right or wrong. It is an expression of you, so create whatever makes you happy. 1. 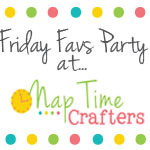 Choose your size and cut out front and back pieces, batting, and any other scraps for decoration. Front and Back - For this particular name tag, the finished size is 3" by 4". Cut two pieces 3.5" by 4.5" to account for 1/4" seam allowances. Batting - Cut the batting to the finished size, which is 3" by 4" in this case. I chose to decorate mine with waves, so I cut oversized strips for each wave. I cut narrow strips of double stick fusible web to apply to the top edges of the waves to prevent the edges from curling up or fraying. 2. Trim the edges of each decorative piece (waves in this case or whatever pattern you choose) with the desired design while holding the adhesive in place. Since I only had to trim them a little into the shape of a wave, my adhesive strips are very narrow. The size of your strips may vary depending on the design. I chose not to apply it to the whole piece because it would add too much bulk. It is really only necessary to give the edges some stability. 3. Iron them in place and top stitch each piece. Lift up the bottom edge of each piece, trim and remove the extra fabric underneath. If not, in this case I would have 4 layers of fabric which would make quilting difficult. Trim the edges to the right size. 4. Embroider your name however you prefer. I used a fine tip disappearing ink marking pen to mark my name first and used that as a guideline. 5. Center the batting behind the front piece and quilt as preferred. 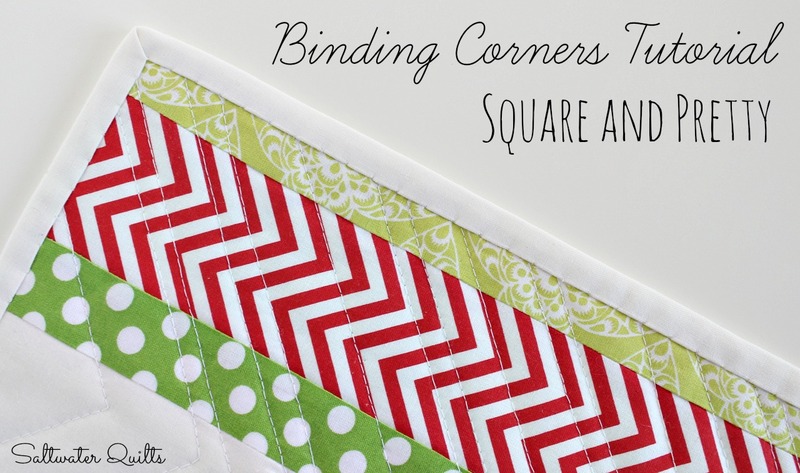 **Different option: If you would like to bind your name tag, layer the back, batting and top before quilting and then add the binding like you would a quilt. 6. Add the backing right side together with the front. Stitch with a 1/4" seam allowance around the edge leaving a 2" opening on the bottom. 7. Trim the corners and turn your name tag right side out. Be sure to push out the corners (a chopstick works great for this). Press with an iron and hand stitch the opening closed. 8. Sew on a brooch pin back and voila! You have fun name tag that is all you! 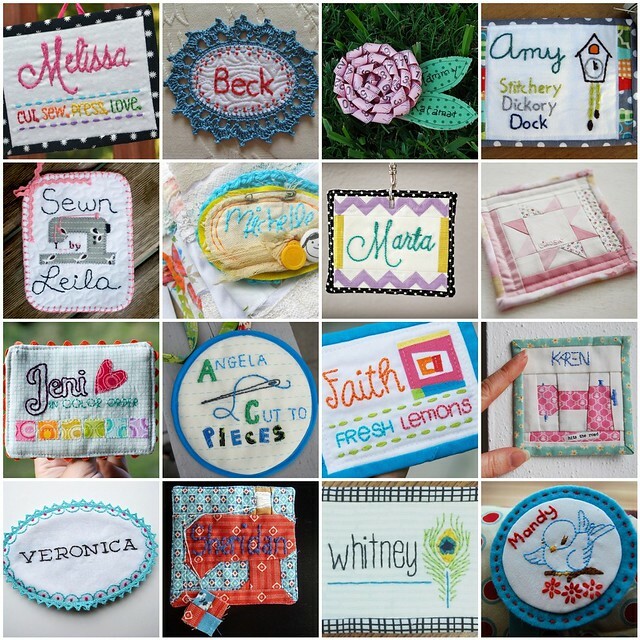 Here is a collage of name tags found on Flickr to help jumpstart your imagination and give you some inspiration. 1. name tag, 2. Sew It Together Name Tag unmasked!, 3. Name Tag, 4. Name Tag for the Sewing Summit, 5. 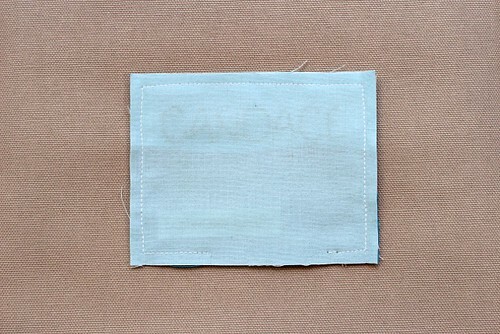 Sewn by Leila Name Tag, 6. A Special Name Tag., 7. Name tag --finally!, 8. 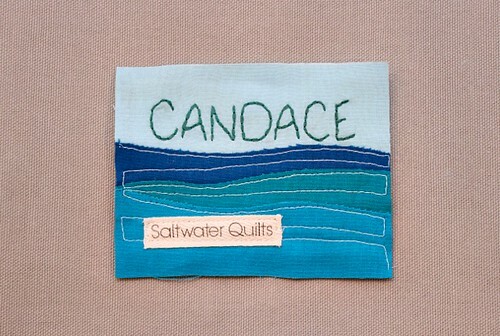 Super Mini Quilt Name Tag, 9. Name Tag!, 10. Sewing Summit Name Tag, 11. Hello, my name is..., 12. Sewing Machine Name Tag, 13. Embroidered Name Tag, 14. Sew It Together name tag, 15. Officially Official, 16. My Name Tag for Sew It Together yay! This is my first time making a weekender bag and I am happy to say that it is completed. I feel like I have gone through some sort of rite of passage. The process of making this bag can be related to childbirth... it is a lot of work, painful, but so rewarding afterwards. When you finish it, you think "I am never making this again!" However, as time passes on you look back and think "It's so cute, I should make another..."
Amy Butler's Weekender Bag is a great pattern. It is very detailed and well explained. This bag is definitely a complicated project, but so worth it in the end. 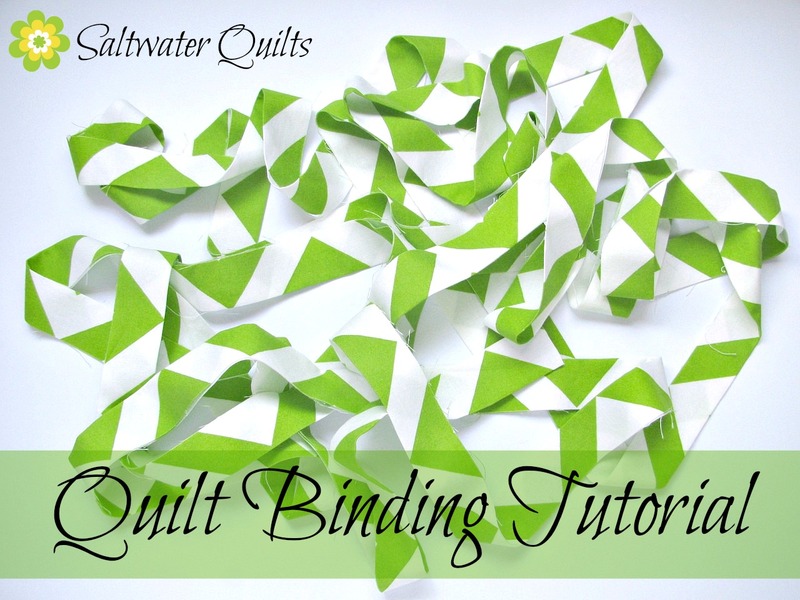 There are so many tips and suggestions out there on the internet that offer ways to alter the original pattern or to just make the process a little easier. Here is a link to one blog that makes a lot of great suggestions... Splendora Falls Weekender. If you search for "Weekender Bag Tips" on the internet or Pinterest, you will find a ton of information. There are so many links on Pinterest! There is even a support group on Flickr... The Amy Butler Weekender Bag Support Group Pool where pictures and tips are shared. I decided to make the first one as the pattern states so I could decide for myself what the pros and cons are. I am going to make two more, one for my other sister and one for myself. However those two will be quilted and will have batting for stability instead of the Peltex. For this bag she did not want the quilted look so the pattern worked out perfectly. Peltex is so great as a stabilizer, but it is such a pain to sew with. The best tips I can give you are to thoroughly read the pattern's directions, take your time and be prepared to build some arm muscles! It is pretty easy going up until you have to sew the different sections together. Everyone suggests using Clover Wonder Clips to hold the layers together which I am going to try next time. This one is a birthday present for my sister. I cannot take credit for the fabric selection. She knew exactly what she wanted. I love the fabrics that she picked especially the stars! I had to be very careful because I wanted the white to stay very white and clean. I had to make sure that my iron and ironing board cover stayed clean. I made sure that I washed my hands before sewing and I kept my sewing machine area very clean. The first thing I told her when she received it was to hose this baby down with Scotch Guard (ok, test a small part on the bottom first, then hose it down). It has to stay clean and pretty! I found some cute charms on Etsy from Bead Sources, but they are not the only shop that sells them. Just search for charms on Etsy and you will find a ton of options! The only change I would make is to put in a metal zipper. There is nothing wrong with the white, I just like the shiny that a metal zipper adds to a project. I also made her a couple of zipper bags to match. 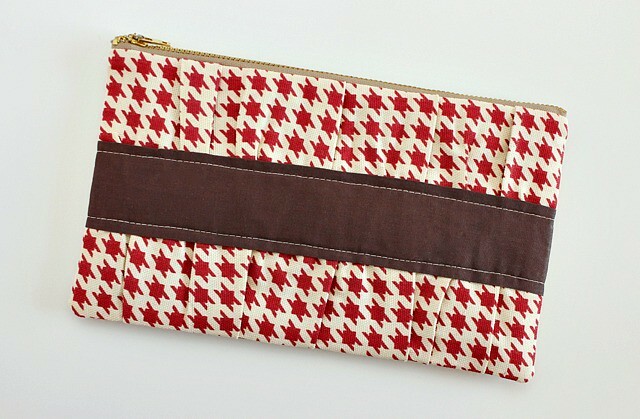 This one is lined with the fabric that I used for the weekender lining, piping and handles. I cut out a square with "The World" on it and made it into a label. This bag is 12" by 12". The second bag is reversed with the lining fabric for the exterior and the star fabric as the lining. Added another charm... I love these! It all came together nicely. 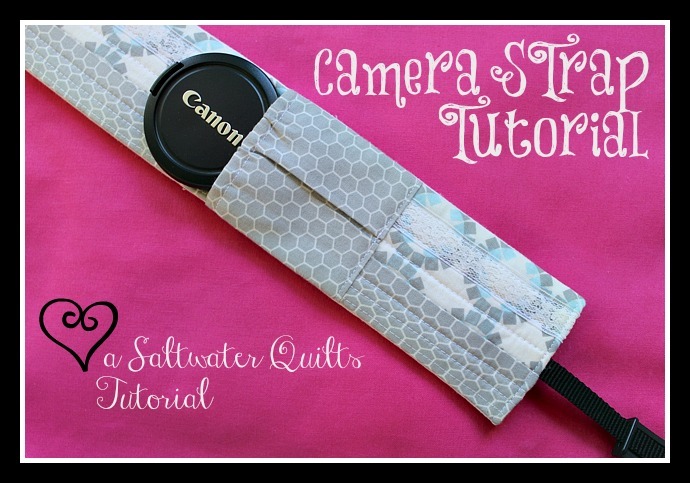 This was not a quick project, but it helped me to improve my sewing skills. I am very proud that I completed it and now that a little time has passed, I am ready to make another one. These are the last of the gifts I made for Christmas. 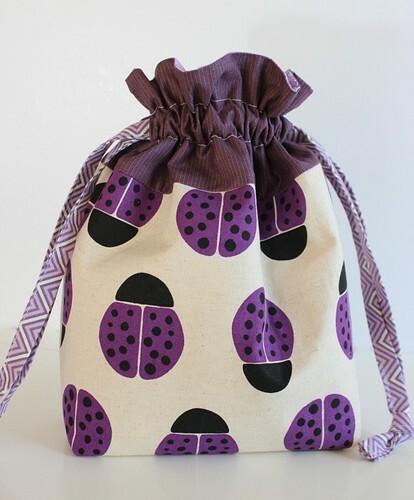 The pattern is Jeni Baker's drawstring bag. It is such a great pattern! She makes it so easy that you can whip up a handful of these in no time. 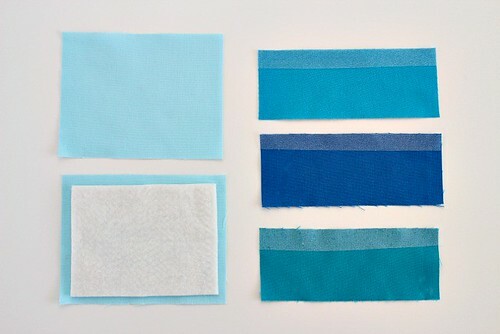 The part of the project that is most time consuming is deciding on which fabrics to use. I made these for my kiddos. They are always playing with matchbox cars and small trains and they like to take them everywhere they go. 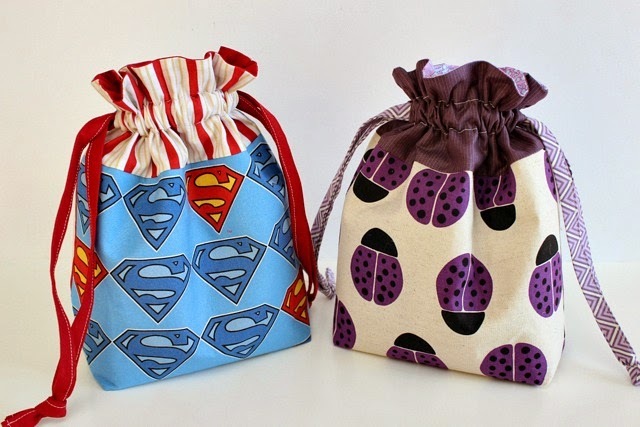 These bags are the perfect size for their little hands and a great way to help them keep up with their small toys. After Christmas we went on a long trip to visit family and they loved to take their little bag along to carry their belongings. The ladybug bag is for my little lady. She loves purple and ladybugs. 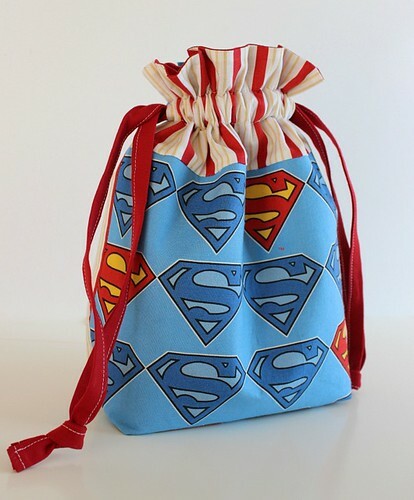 The superman bag is for my little man. He loves anything that has to do with a super hero. I made this clutch for my sister. 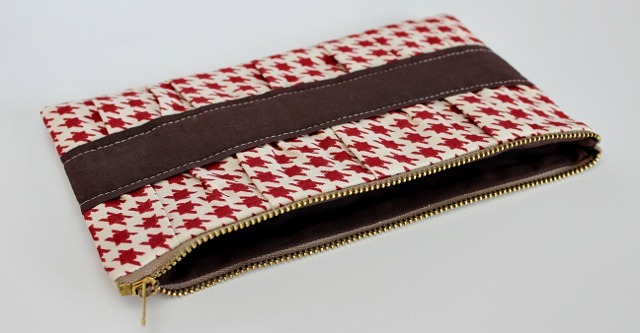 The pattern is a Gathered Clutch by Anna over at Noodlehead. 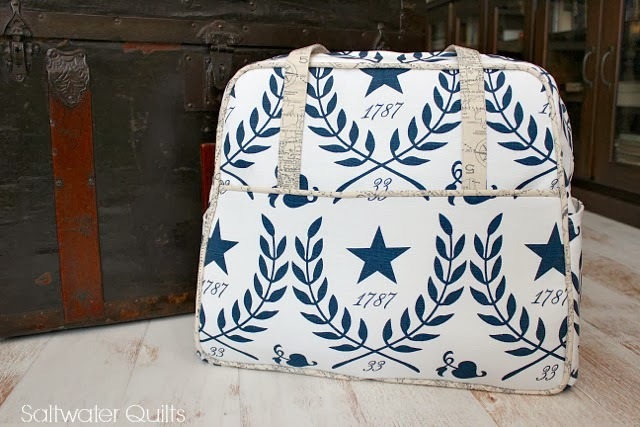 This bag is another quick sewing project. I made my sister a larger duffle bag out of these fabrics a couple of years ago and decided she needed a little clutch to go with it. I love using these zippers made with the gold metal. They add a little shiny to the bag. 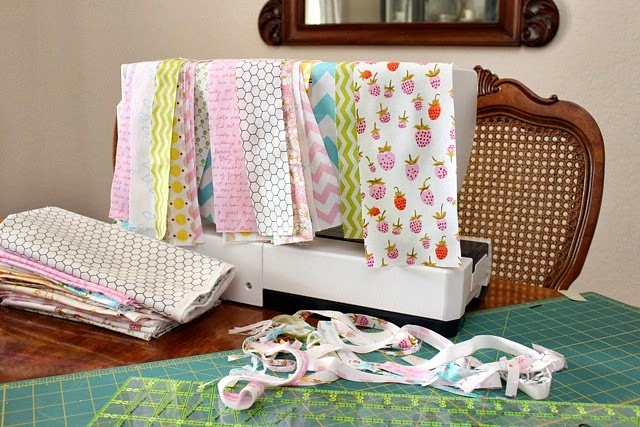 Before we know it, it will be time to start sewing for Christmas gifts again. I plan on starting in the summer! 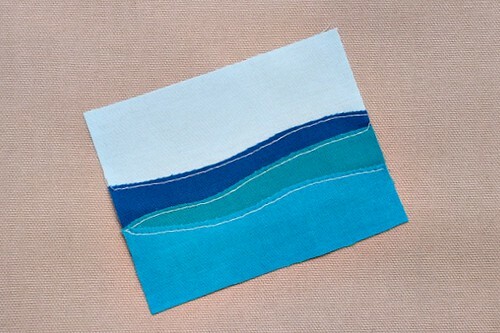 I have shared many mug rugs with you, but I always make them around 8.5" by 5.5" and bind them like a quilt. This time I decided to change it up a little by making it square and adding a ruffle. 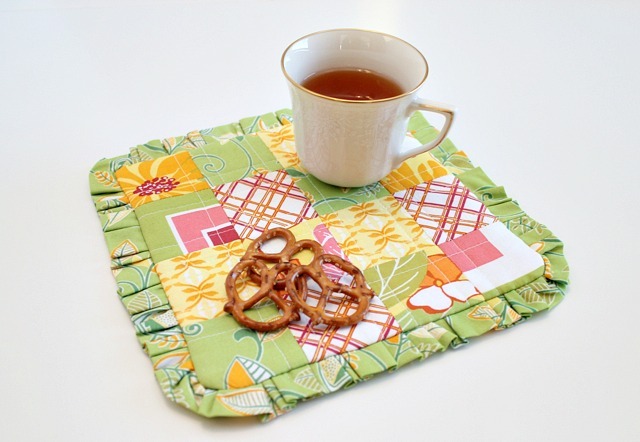 It is a really quick and easy project and makes a great gift. 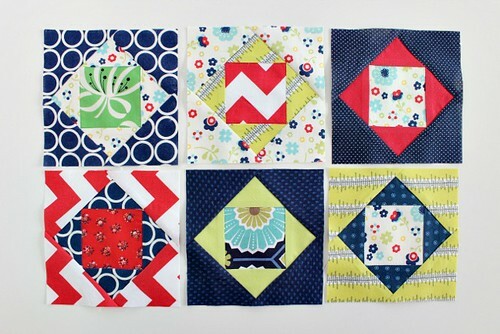 I have been sewing away on my economy blocks and I have to share them with you. When I am finished you are definitely going to get your fill of them. 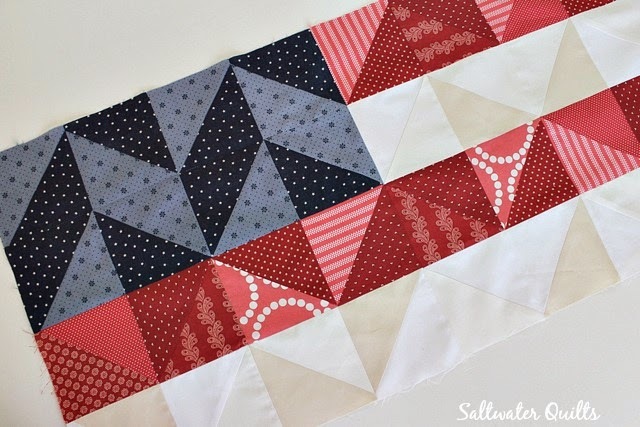 I am making a large throw sized quilt and am going to need over 200 blocks. 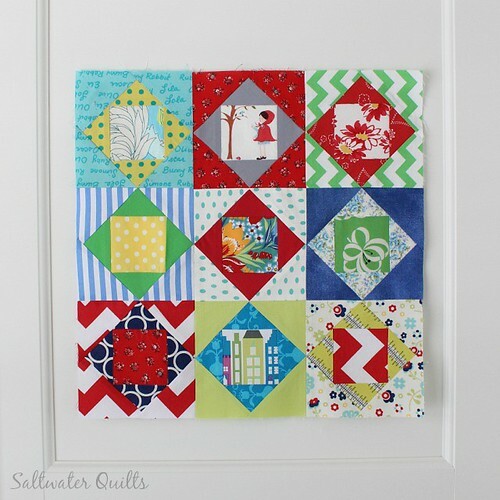 These red, navy and green blocks are some of my favorites! The top left with the green ribbon flower center is in my top 10. 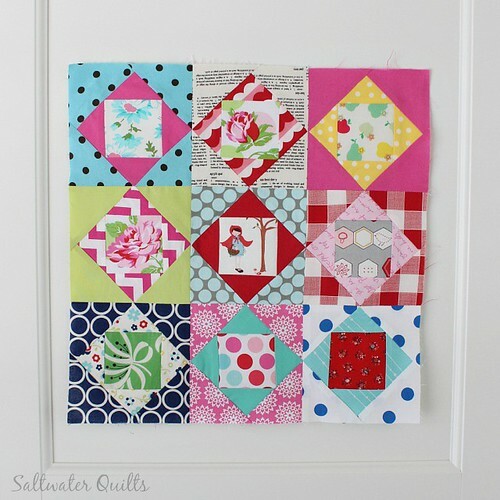 Pinks and aquas... these colors make me so happy! 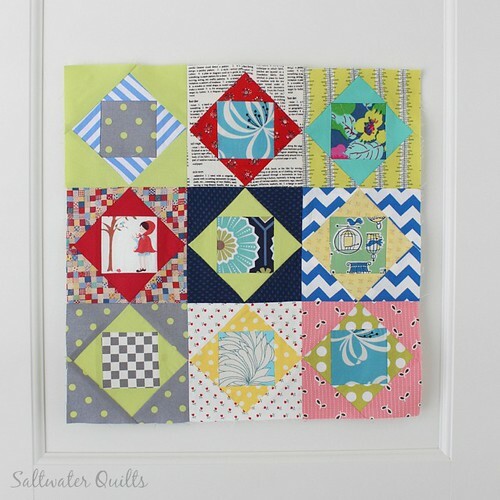 I love the plaid and the solids! 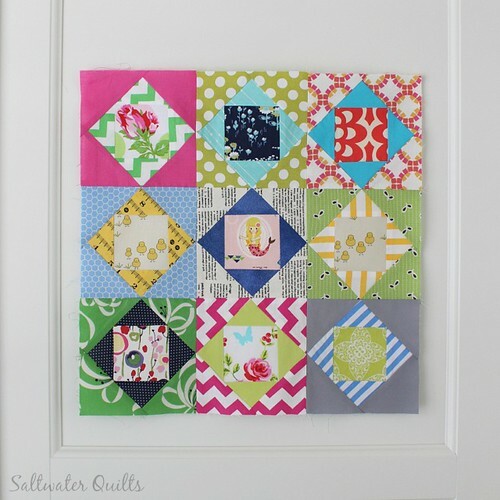 Mental note: I need to make more blocks with solids. 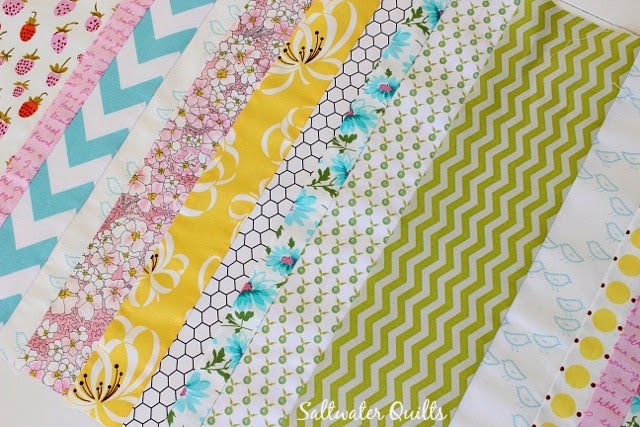 The green ribbon flower fabric by Denyse Schmidt is one of my all time favorite fabrics. It is hard to use it, but I love it when I do. I am never sure which way to go, use it and run out or save it for later and let it collect dust. Oh, decisions! How cute are these little chicks?! 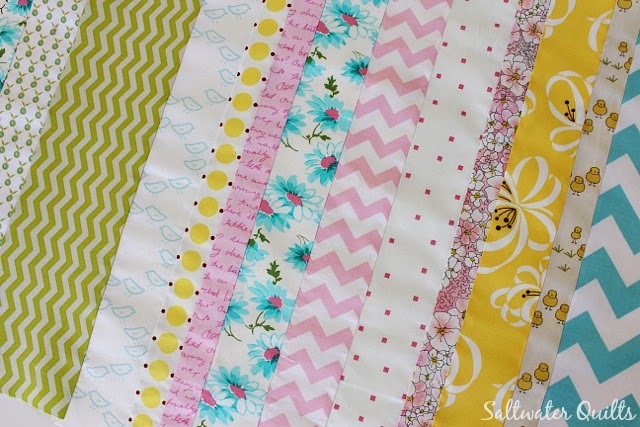 The yellow stripe... another favorite fabric. What can I say... I am a simple girl. I have had a lot of fun playing with so many different fabrics and working with different combinations. 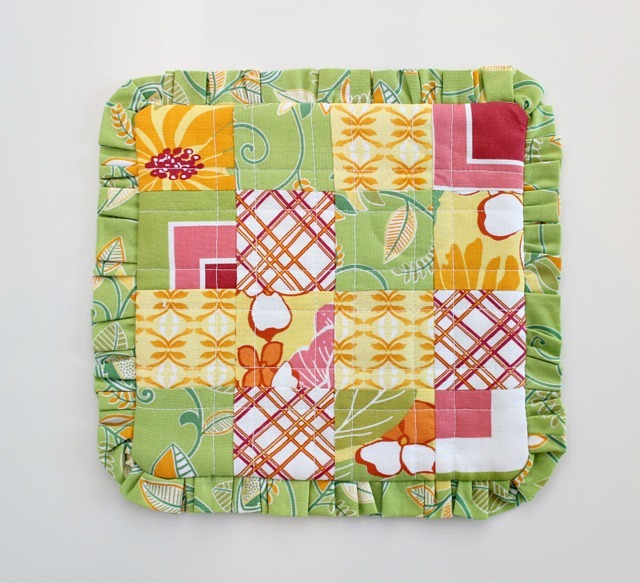 It has been a great exercise to force me to put fabrics together that I normally would not. It has really pushed me out of my comfort zone, which is where I like to stay all the time. 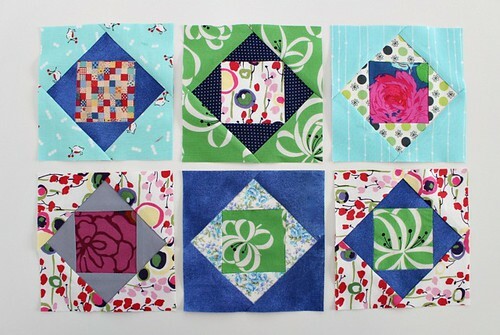 I am really excited to see all of the blocks come together in one quilt! 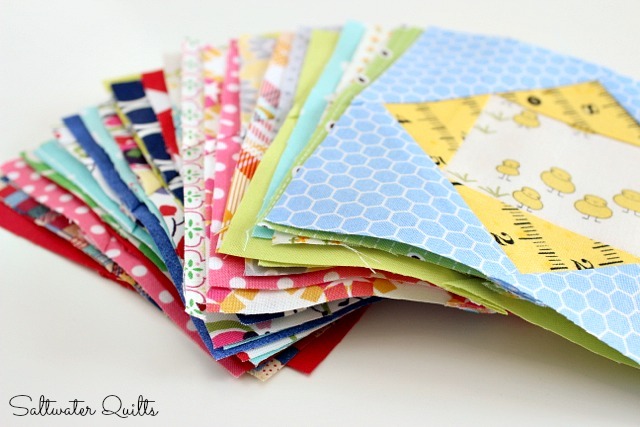 In my last post I asked for advice on the best way to save and organize scraps. Thank you so much for all of your advice!! There were a lot of great suggestions that I am thinking over and I will let you know when I figure out what I am going to do. I haven't been very efficient when it comes to the scrap department and my pile keeps building. With my current system, I just stick all scraps, no matter the size, in a divided storage container with three drawers. One drawer for cool colors, one for warm, and the other for neutrals. The problem is that I am not really using them. Some are fabrics that I don't want to reuse, so why do I keep them? Because I have a problem and can't throw anything away! I need to work on that. My system is off balance right now. I spend more time saving and less time using the scraps. I have spring fever and want to clean out all the clutter in my house, which includes my growing scrap pile. I will get this figured out! Thank you everyone for all the great ideas to get me started! !